Boyfriend blazers and oversized blazers have a little bit in common. When researching the trends I see that boyfriend blazers were all the rave in 2011 while over sized blazers and tuxedo dresses came in strong during 2012. All of the styles are still worn today, they all still look good and give off a little different vibe. 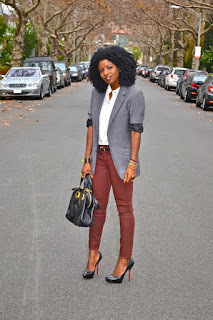 Boyfriend blazers are usually paired with form fitted apparel, while the oversized blazers have been worn many times with no other bottoms as a dress. The oversized blazer is a little longer and has been know to have a deeper V and double breasted buttons. I love this trend, how about you? Would you ROCK it?